The control or elimination of neglected tropical diseases (NTDs) has targets defined by the WHO for 2020, reinforced by the 2012 London Declaration. 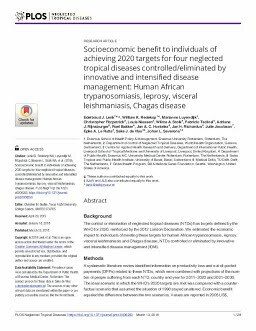 We estimated the economic impact to individuals of meeting these targets for human African trypanosomiasis, leprosy, visceral leishmaniasis and Chagas disease, NTDs controlled or eliminated by innovative and intensified disease management (IDM). A systematic literature review identified information on productivity loss and out-of-pocket payments (OPPs) related to these NTDs, which were combined with projections of the number of people suffering from each NTD, country and year for 2011±2020 and 2021±2030. The ideal scenario in which the WHO's 2020 targets are met was compared with a counterfactual scenario that assumed the situation of 1990 stayed unaltered. Economic benefit equaled the difference between the two scenarios. Values are reported in 2005 US$, purchasing power parity-adjusted, discounted at 3% per annum from 2010. Probabilistic sensitivity analyses were used to quantify the degree of uncertainty around the base-case impact estimate. The total global productivity gained for the four IDM-NTDs was I$ 23.1 (I$ 15.9 ±I$ 34.0) billion in 2011±2020 and I$ 35.9 (I$ 25.0 ±I$ 51.9) billion in 2021±2030 (2.5th and 97.5th percentiles in brackets), corresponding to US$ 10.7 billion (US$ 7.4 ±US$ 15.7) and US$ 16.6 billion (US$ 11.6 ±US$ 24.0). Reduction in OPPs was I$ 14 billion (US$ 6.7 billion) and I$ 18 billion (US$ 10.4 billion) for the same periods. We faced important limitations to our work, such as finding no OPPs for leprosy. We had to combine limited data from various sources, heterogeneous background, and of variable quality. Nevertheless, based on conservative assumptions and subsequent uncertainty analyses, we estimate that the benefits of achieving the targets are considerable. Under plausible scenarios, the economic benefits far exceed the necessary investments by endemic country governments and their development partners. Given the higher frequency of NTDs among the poorest households, these investments represent good value for money in the effort to improve well-being, distribute the world's prosperity more equitably and reduce inequity.